An industry leader in manufacturing deep-drawn cans and cases out of Wilbraham, Massachusetts, recently installed a CBG 15-Gallon PW4 Solvent Recycling System to recover Perchloroethylene contaminated with aluminum particles, oil and wax. 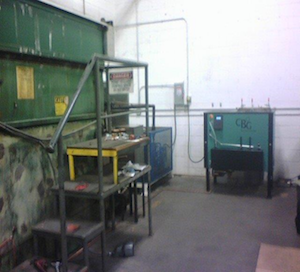 CBG’s PW4 solvent recycling has positively impacted operations in many areas of their production process including reduced solvent usage, production processing time, safety, and efficiency, “The integration of the PW4 allows us to perform a seamless solvent cleaning process that doesn’t interrupt our production or cause downtime. The PW4 allows us to use these very specialized/expensive materials for a longer period of time, as well as reducing our environmental footprint.” Pincince also had very high praise for CBG’s technical support and service, indicating “whenever we buy new machinery I expect everything to go bad. CBG’s technician level of knowledge of the machine, the process used, and a common sense approach made the installation process go extremely smoothly.” Norpin expects to reduce their overall solvent usage by at least 50% in the first year, but production personnel noticed cleaner parts and solvent right away. The immediate result was a significant reduction in cleaning process cycles and overall cycle times.